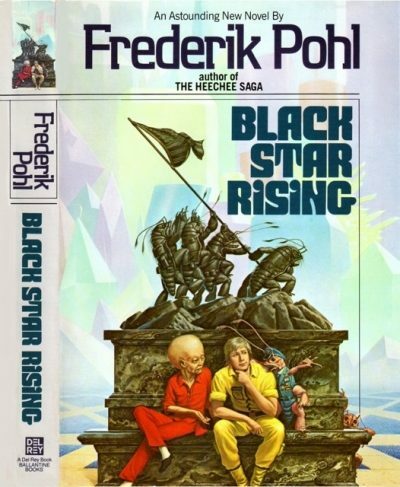 Frederik Pohl’s 1985 Black Star Rising is a standalone science fiction novel. The world is divided into two spheres, one dominated by India, one by China, These two powers were the only slightly damaged by an apocalyptic nuclear war that ravaged the United States and the Soviet Union. North America falls under China’s benevolent umbrella. Its aboriginal population is monitored by Chinese supervisors. Castor is an Anglo farmer with pretensions above his class. Denied entry into university, he is an autodidact, hoovering up knowledge of no relevance to his duties to the Heavenly Grain Rice Collective. Elevation from this humble but necessary role comes courtesy of two unrelated events: a brutal murder and what seems to be a First Contact event. The murder proves to be an open and shut case. Because Castor found the head, he comes to the attention of Inspector Tsoong Delilah; less interested in his brain than his attractive body, she takes him as a convenient lover. To China’s alarm, a spacecraft approaches the Earth, issues a number of bellicose communiques regarding occupied America, then demands to speak to the American president. Since the space craft is demonstrably in command of weapons that could scour life from a good fraction of the planet, China is eager to offer the visitors the president they demand. The only problem is, the last president died when the United State committed mutual suicide with the Soviet Union. Castor has just the right qualifications to be nominated and then elected in a hasty election of dubious legitimacy. He is alive, an Anglo, and he has come to the attention of Tsoong. In short order, Castor finds himself occupying an office vacated by WWIII, off on a mission to talk to the visitors, and, everyone hopes, to prevent another apocalypse. The first thing Castor and his companions discover is that among the mysterious ship’s functions is the ability to open portals between one star system and another. The craft containing the diplomatic mission is transported to World. There Caster, Tsoong, and company are confronted by the descendants of an American starship1 launched before WWIII. By itself, the American relic would be a mere historical oddity. The problem is the alien erk with whom the Americans have allied. The erk are energetic, loyal unto death to allies, and armed with the same powerful technology that swept the erk’s creators into extinction. If accommodation cannot be reached, the war that is coming will make WWIII look like a minor squabble. The Americans and the erks have spend generations preparing for a just war. Accommodation is not on today’s menu. Pohl’s 1977 Gateway won Pohl the Campbell2, the Hugo, the Nebula, the Locus and the Apollo. Remarkable books can make subsequent books look lackluster by comparison, even when the subsequent books are of reasonable quality. Comparatively minor works like Black Star Rising suffer even more from invidious comparisons. Lacking a personal copy to review I turned to Kitchener’s public library, which we, in our straightforward Canadian way, call Kitchener Public Library. To my surprise, not only was KPL in possession of a copy of Black Star Rising, it was the same first edition hardcover I read back in the mid-1980s. A glance at the ISFDB entry for this novel suggests that this is not so coincidental: Black Star Rising didn’t rate many editions so if the library had it at all, it is not so surprising that copy is a hardcover that somehow navigated between the Scylla of being signed out so often it wore out and being signed out so infrequently that it was retired from the stacks3. On the one hand, Black Star Rising’s vision of what Red China might be like in a century is… unimaginative. There is less distance between party doctrine as perceived in the West in 1980 and this imagined 2105 than there was between China circa 1980 and now, or between 1980 and 1985, for that matter. On the other hand, as visions of Chinese hegemony over the US go, Pohl’s is pretty humane. The Chinese in North America outnumber aboriginal Americans not because there are so many Chinese migrating to what is after all a desolate and often radioactive backwater, but because there are so few descendants of 20th century Americans. Elsewhere the Chinese are somewhat less humane. Americans can be counted on to regulate their own numbers but the novel notes that the Chinese have provided Africa with unrequested fertility control in the form of sterility gases. How curious that an American author would select Africa in particular for this role. There is a general assumption that American = Anglo on the part of the Chinese and the star-faring Americans. The author did not so assume; his cast includes Feng Miranda, a rather vexed Chinese-American woman whose roots go back well before WWIII. This perplexes both the Chinese (why would someone of seemingly good birth identify with aboriginals?) and the white Americans as well. The Chinese see their rule as benevolent charity; Feng is the most ardent supporter of American independence … at least until the off-world Americans arrive. They have extremely narrow views concerning the ethnicity of true Americans. As far as the plot goes…. This is intended as a humorous moral tale, with a cast of largely immature eccentrics into whose hands the fate of the world is placed. Most of the characters, particularly the Americans (off-world and otherwise), are childlike and foolish, more focused on their personal desires than grander goals. The comedic elements are far from subtle. So too is the moralizing: for some reason, Pohl is against nuclear war and any solution to the Fermi Paradox that involves frequent extinctions and he wants the reader to understand this. Set next to books like Not This August, Armageddon 2419 AD, or Sixth Column, this book’s racism is mild. Pohl at least recognizes the humanity of the Chinese, never a given for older SF. Unfortunately, even though the novel lacks many of the worst traits of its sub-genre, it’s still not a notably good book. The novel may have its fans, but you can put me in the “well, it could have been much, much worse” camp. 1: Dispatched to Van Maanen’s Star, a white dwarf fourteen light years away. Why anyone decided to send a starship to the dead relic of a star is not clear. Nor is it plausible that the American astronauts should have been so surprised when the system proved so hostile. Good thing for them that there was an erk gate ship there. 2: Not that Campbell Award. The other one. 3: The computer records only go back to 1992 but in that time it has been signed out about thirty times. KPL information department for the win! Apart from maybe-planets and planetary matter, Van Maanen's Star was mentioned by Larry Niven and C. J. Cherryh as respectively the mission goal in "A World Out of Time" and the location of another starbase in "Downbelow Station".